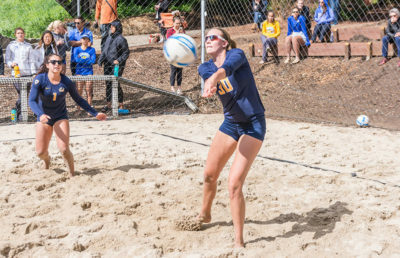 The sun was bright and the wind was light at Pacific’s Raney Sand Volleyball Courts, where Cal beach volleyball demonstrated that the 2018 season ahead appears promising for the young team. Cal opened the season with a weekend split, falling to St. Mary’s, 3-2, before regaining focus to crush the host team, Pacific, 4-1. “The mentality going into the day was really positive because we had such a long offseason,” said senior Bryce Bark, one of the team’s captains. In the duel against St. Mary’s, there were multiple close matches. Against the Gaels’ No. 2 pair of juniors Lindsey Knudsen and Emily Bible, Bark and partner sophomore Madison Dueck put up a tough fight in the first set, pushing the 21-point set out before eventually falling, 26-24. In their first competition of the season, freshmen Maddie Micheletti and Caroline Schafer fell to their opponents in a tight three-set match. The freshman duo rebounded from a 21-14 loss in the first set to take the second set, 21-18, calling for a 15-point tiebreaker set. Although they fell to the Gaels’ No. 4 pair in the tiebreaker, 15-8, Micheletti and Schafer dominated in their match against Pacific, winning 21-11, 21-16. Cal’s No. 3 freshmen pair Mima Mirkovic and Alexia Inman were the girls who stole the show over the weekend. 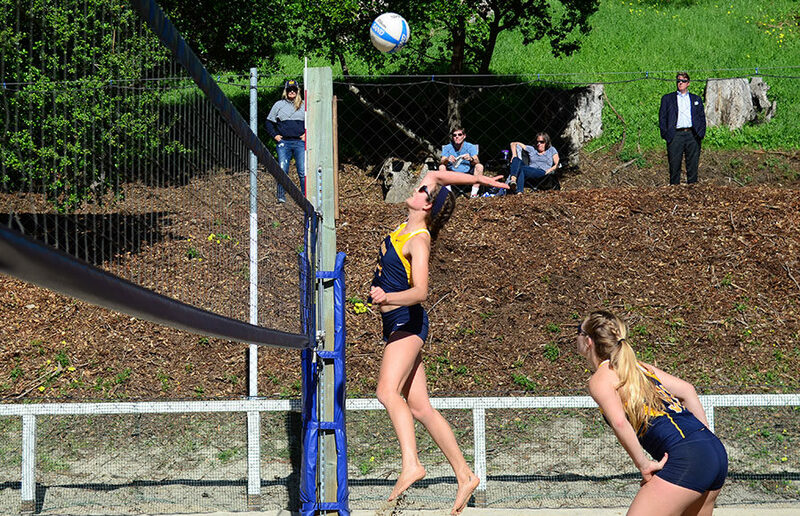 Only in their first collegiate beach volleyball matches, the duo was Cal’s only pair that won both of their matches. After beating their St. Mary’s opponents in three sets, Mirkovic and Inman put away Pacific’s Taylor Poncetta and Hanne De Schrijver with a decisive 21-13, 21-8 victory. Mirkovic and Inman weren’t the only ones who had solid wins against Pacific, as Cal’s other three wins were all executed in two sets, with the opponents never scoring more than 16 points. Having strong senior leadership is especially important on a young team, where two of Cal’s five competing pairs have never done so before in a college setting. Though senior captain Teya Neff won’t be getting closer than the sidelines for a while because of an injury, Owusu said Neff’s leadership wasn’t compromised this weekend.